New York Times: "Now Is the Season for Japan"
I still remember the April Fool's Day joke from Google that Google was starting a new phone service that uses toilet sewer pipes. I thought, "That can't be... but..."
It looks like Professor Hayakawa of Gunma University is taking it seriously now, and wondering how a Nintendo machine can use Google Map. "Sakura" in Japanese usually means cherry blossom trees, but these days it increasingly mean "a shill" for the government or for big corporations. Yesterday in Kyoto, it was the latter. The person who posted the photo says this guy tried to pick a fight with a person who took a picture of him on his smartphone, in a way that a yakuza would do. Therefore, the conclusion was that he was a low-level official at the Ministry of the Environment. I don't know about that, though it is possible. I thought he was from the waste disposal industry. Minister Goshi Hosono shamelessly said "Look, we have supporters for the wide-area disposal here today!" For the video of the entire event, go to my previous post. German TVs tend to do the voice-over instead of captions, and the voice-over is too loud for me to hear what exactly the Japanese are saying. Sometimes their voice-over does not match what people are actually saying in Japanese. Is it even a question after what happened in last year? Well, clearly it is, for many farmers who grow fruits in Date City in the middle third of Fukushima with elevated radiation levels. 40,000 becquerels/kg of radioactive cesium was detected on the surface of peach trees in the city's orchard in the mountain. One grower is determined to grow this year again, the other has given up. Radioactive cesium exceeding the safety standard can be a matter of life and death for the producers. Particularly, fruit growers who have only one harvest per year have big worries. Late March in Date City in Fukushima Prefecture, where "specific evacuation recommendation spots" are scattered throughout the city. In an orchard in the mountain, the trunk of a persimmon tree is white. Grapevines are reddish brown. Both are the result of high-pressure washing that blasted off the barks. "No matter what the standard is, as long as there are fruit tries, I have no choice but grow fruits", says a man (age 50) who grows grapes, peaches and persimmons in his 1 hectare orchard. In the last growing season, 80 to 90 becquerels/kg of radioactive cesium was found from peaches harvested nearby. It was below the 500 becquerels/kg provisional safety limit, but with the new 100 becquerels/kg standard, it would be close to the limit. "Once [the trees are] decontaminated, it should be OK. But the consumers won't buy it unless there is zero cesium." He was compensated by TEPCO, but he says, "I'm not growing for compensation. I'm growing so that people would say it is tasty." There are farmers who has given up. Shigeharu Sugano [could be Kanno] (age 65), who has grown peaches for a long time in the same area, pulled out half his trees last year in order to make room for temporary storage for the decontamination wastes. However, from the surface of the rest of his trees, 40,000 becquerels/kg of radioactive cesium was detected. He gave up. "I can't do it any more." It was a half century ago that the local farmers switched from sericulture to fruit growing because of the drop in price in sericulture. "Unless we find something new, younger people won't come back", says Sugano. That "something new" hasn't been found. With due respect to Mr. Sugano (at least he has given up growing peaches on his highly contaminated orchard), I don't think it's a matter of finding something new to grow. Last year, Fukushima Prefecture even used school children to push Fukushima peaches, and they were widely sold all over Japan, even to customers who had never seen peaches from Fukushima in their local supermarkets. Why not do that again this year? It worked last year. Just keep smiling. Disaster Debris Wide-Area Disposal PR in Kyoto: Ministry Official Wearily Says "Unprecedented Number of Protesters..."
Yomiuri Shinbun Kansai version did carry the report on the Ministry of the Environment event in the Kyoto Station yesterday. On March 31 in front of the Kyoto JR Station (in Kyoto City), Minister of the Environment Hosono appealed for accepting the disaster debris in Kyoto. He was flanked by other officials including Keiji Yamada, governor of Kyoto. The minister called to the crowd, "Please think about Miyagi and Iwate, not just about yourselves." But residents opposing the debris acceptance surrounded him, and he had to cancel the distribution of the [promotional] fliers. It was a street event rolled out by the Ministry of the Environment, "Disaster Debris Disposal Project, by Joining Hands". It started in Tokyo on March 11, and this Kyoto event is the 5th event, and the first in Kansai Region. Citizens held up signs that said "We are against the wide-area disposal" "Debris, No" [in Kyoto dialect], and shouted "Go back" and "Protect children". An official at the Ministry of the Environment who accompanied the Minister admitted, "This was an unprecedented number of protesters." Minister Hosono spoke after the event, looking a bit tired. "I cannot give up. I want to proceed on the wide-area disposal, so I hope to persuade as many locations as possible." It was not just a number of people against it that was unprecedented; ordinary citizens shouting down the minister of the national government and other politicians was unprecedented. If I strictly translate what Yomiuri called "反対派", it is "opposing faction", as if this was an organized movement by an established/existing organization. From what I saw, the only "organized" movement was those few men holding up signs that said "Kizuna (ties that bind)", "Let's promote wide-area disposal", with characters neatly printed. To view the Kyoto residents shouting down the politicians including Hosono, chanting "go back, go back", or "protect children", go to my previous post. Hosono and his officials are right now in Kyoto, trying to persuade Kyoto residents that they have to accept disaster debris, and the protesters want to have none of that. Hosono has to shout to be heard over the ruckus. He's trying to appeal to the people in Kyoto by showing some craft piece made by a Miyagi elementary school child. "Do you think this is contaminated? Do you?" Here's the recorded video of the event. At about 7 minutes into the video: No.3 guy at Ministry of the Environment (politician) starts to speak, appealing to the small crowd at Kyoto Station how important it is to help out the people in the disaster affected area whose towns are still buried under the mountain of debris. "See this photo?" he says. At 8:55, you see two guys in bright green vests holding up signs that says "Kizuna". How much more blatant can you get, to show you are the Ministry's shills? At 11:30, Goshi Hosono, Minister of the Environment, takes the stage. He is immediately being shouted down by angry crowd. He has to change the microphone to be heard above the shouting. At 16:00, Hosono desperately grabs a craft piece made by an elementary school kid in the disaster affected area, and tries to tell the angry audience "Do you think this is contaminated? Do you?" People keep shouting at him, "Kaere, Kaere (Go back, go back)". At 23:00, Governor of Kyoto takes the stage. People keep shouting him down. At 27:40, Fukuyama, DPJ politician from Kyoto and advisor to then-Prime Minister Kan when the disaster struck, takes the stage. People keep shouting "Go back, go back". Fukuyama pleads with them that he is from Kyoto, and he comes back here. People keep shouting "Go back, go back". People are telling him to go back to where he belongs, which is the center of the central government who wants Kyoto to accept and burn debris. At 32:00 Fukuyama resorts to citing "democracy" as the reason why these protesters should quietly listens to him. People keep shouting "Go back, Go back". That was rich. "Democracy". Was it a democracy to simply decide to spread the disaster debris all over Japan without even asking people? Good for Kyoto people. I've never seen anything like this where people refuse to quietly listen to a politician, and instead they shout them down. I am surprised that they didn't call in the police, but as Iwakami's IWJ was there netcasting live, that would have really made the already ugly scene for the Ministry of the Environment even uglier. There is ZERO coverage of this incident in the national newspapers, not even in their local Kyoto versions. All there are in the local versions of the national papers is how eager and willing and ready Kyoto is to accept and burn the disaster debris. The subscription-only magazine called "FACTA" has the first paragraph of the article available for everyone. It may just mean the company is getting out of building new reactors. The company is still part of the government's working group to develop new technologies for decommissioning Fukushima I Nuclear Power Plant. The company could commercialize these technologies to sell to the world, I suppose. Hitachi is also a big player in incineration plants and equipments, and alternative energy (wind turbines). The company looks set to profit no matter which direction Japan may take. The same can be said for other two nuclear companies, Toshiba and Mitsubishi Heavy Industries. They are also big in incineration plants and wind turbines. Hitachi Ltd. (NYSE: HIT) said it has agreed to a concession agreement with the Lithuanian Energy Ministry regarding construction of the Visaginas nuclear power plant planned for Lithuania. The concession agreement will be officially concluded after the approval by the Lithuanian parliament which has been in session since March 2012. Lithuania is planning to construct a new nuclear power plant in Visaginas in the northeastern part of the country, with the aim of having an operational plant in 2021. In 2008, the project company Visagino Atomine Elektrine (VAE) was established to further the development of the project and conduct negotiations relating to investment into the Visaginas Nuclear Power Plant. In 2009, the Lithuanian parliament passed a bill permitting the construction of a nuclear power plant in Visaginas. Hitachi and Hitachi-GE Nuclear Energy Ltd. proposed to provide an Advanced Boiling Water Reactor (ABWR) to the Lithuanian government. Hitachi was selected as the strategic investor in July 2011, and in December 2011 initially signed the term sheet for the concession agreement. Following the approval of this agreement by the Lithuanian parliament, the concession for power plant construction will be granted to a project company to be established by investment from Hitachi, VAE and regional partners. The project company will conduct negotiations regarding engineering, procurement, and construction. The project company will aim to conclude contracts by around summer of 2012. 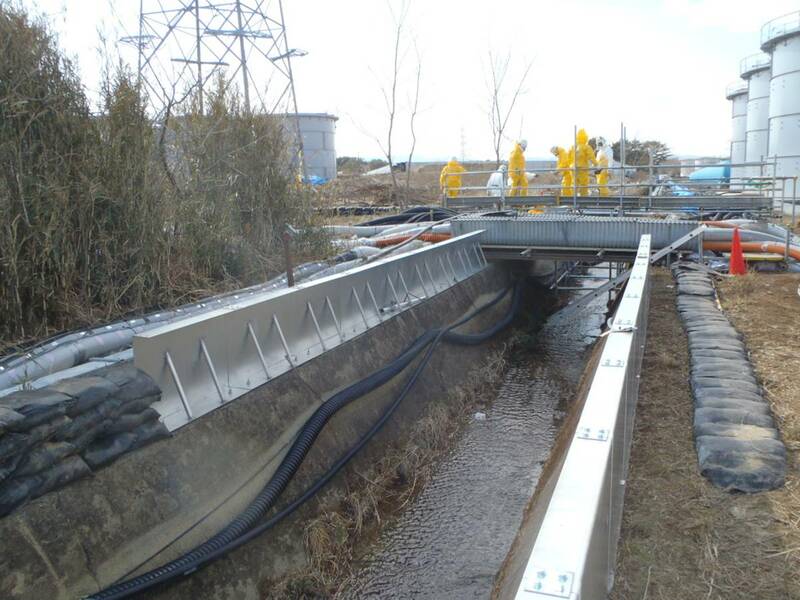 TEPCO has a countermeasure to the leak of highly concentrated, contaminated water after the reverse osmosis treatment. Sandbags. And some shiny steel "barrages" as TEPCO calls them. Note a heap of hoses in the 2nd photo, upper right. Also the hoses under the temporary bridge. How about the hose hanging on the side of the drain? 40 more years (or more) until they can even begin the decommission. Another "win" for the Ministry of Foreign Affairs, who operates the ODA (Official Development Assistance). They have managed to obtain support from the United Nations on this one. I first wrote about this particular ODA in June last year, with the follow-up post in September when the Ministry of Foreign Affairs formally requested the appropriation for the 3rd supplementary budget. Now it's official, with the help of the UN. Canned fish from Tohoku will be given to people in developing countries in the world so that the fisheries in the disaster-affected areas can recover and "baseless rumors" disappear. The fish cans will go to Cambodia and 4 other countries and will be used in school lunches to feed school children. The Japanese government exchange letters with the UN WFP (World Food Programme) regarding the ODA (Official Development Assistance) so that people in developing countries will be able to eat processed marine products made in the areas affected by the March 11, 2011 earthquake and tsunami. The purpose is to promote [the recovery of] fisheries industry in the disaster-affected areas and to dispel baseless rumors [that food in Japan is contaminated with radioactive materials]. The Japanese government allocated 1 billion yen in the fiscal 2011 3rd supplementary budget. Using this money, WFP will purchase cans of boiled sardines and mackerels made in factories in Aomori, Iwate, Ibaraki, and Chiba Prefectures. The cans will be shipped to 5 countries including Cambodia for the use in school lunches. Toshiyuki Kato, parliamentary secretary of the Ministry of Foreign Affairs [No.3 politician at the ministry] emphasized in the letter exchanging ceremony, "The marine product processing companies in the disaster-affected areas have sustained grave damage, and they are doing their best to resume full operation." There are a few citizens' groups who oppose this particular ODA program as they are worried about the effect of the Fukushima I Nuclear Power Plant accident. The top officials at the Ministry of Foreign Affairs explain that the radiation measurement will be conducted, and only those products without any worry of safety will be exported so that the baseless rumors that still persist overseas are dispelled. When the Japanese government officials say "without any worry of safety", their safety equals 100 becquerels/kg of radioactive cesium starting April 1, 2012. I couldn't find any press release on this, and no information as to other 4 countries receiving the canned fish from Japan. Here's from the feedback page of the Ministry of Foreign Affairs. You can contact them by mail or by phone, or you can contact the embassies and consulates around the world. Remember that harebrained project that the Ministry of Foreign Affairs said it would do after grabbing some extra money in the supplementary budget last year? Well it has just started. "An Invitation Program to Japan for SOCIAL MEDIA WRITERS: Hello social media writers!--the Government of Japan invites you to participate in an opportunity to travel to Japan and share your experience through social media." An Invitation Program to Japan for SOCIAL MEDIA WRITERS: Hello social media writers!--the Government of Japan invites you to participate in an opportunity to travel to Japan and share your experience through social media. - objective: to share your impressions, positive experiences, and attraction to Japan through social media i.e blogs, Facebook, &Twitter. Witness a vibrant Japan as it recovers from the disasters of the Great East Japan Earthquake. - area of interest: pop culture, fashion, design, science & technology, Japanese food culture, sports, academia, art, etc. - You should have more than 1000 followers per social media profile. After returning to Canada, participants will be required to write at least three articles about their visit. *Embassy of Japan may request candidates to visit the Embassy for an interview. Please apply & spread the word! The anon reader who gave me the link says the Embassy people (or whoever is managing their Facebook page) keep deleting the negative comments. The Japanese people I know are all disgusted with the government scheme and they are extremely ashamed. And angry that their tax money is being used like this by their government. This is hilarious. I clicked on the link in the Embassy's Facebook post to take a look at the application form. IT'S AN EXCEL FILE! Are we still in the late 1980s, when companies that were very much behind the curve about computers were using Excel spreadsheet as word processor? So these Ministry of Foreign Affairs officials do not even know how to create a simple form either in editable PDF format or web format, and they want to invite social media writers. Seikatsu Club is a co-op that has been publishing the results of its own analysis of food items it sells. For people trying to eliminate as much radioactive cesium as possible from the food they eat everyday, it's not getting any easier after one year. Wood's Hole Oceanographic Institute researcher Ken Buesseler wrote a special article for CNN on March 11, 2012 about the effect that radioactive materials released from Fukushima I Nuclear Power Plant have had on the ocean and marine life. He led a team of international researchers last June to survey the ocean where the contaminated water was dumped by TEPCO. He seems more concerned now than when the initial report of the June survey was released (see my previous post). (CNN) -- One year ago, a series of events began with an earthquake off the cost of Japan that culminated in the largest accidental release of radioactivity into the ocean in history. We have to be careful and say "accidental" because in the late 1950s and early 1960s, 50 to 100 times more radioactivity was released worldwide as fallout from the intentional testing of nuclear weapons. The word "ocean" is also important, since Chernobyl in 1986 was hundreds of miles inland, so it had a smaller impact on the concentrations of radionuclides in the sea than was measured directly off Japan in 2011. One year later, we have to ask, what do we know about Fukushima's impact on the ocean and levels of radioactive contaminants in water and fish? In many ways we were fortunate that impacts were largely confined to the ocean. Certainly, the Japanese people continue to feel devastating effects of so large a release within their country, and many people may never be able to return to their homes. But in general the winds during the height of the accident at the Fukushima Daiichi nuclear power plant were blowing offshore. As a result, more than three-quarters of the radioactivity fell on the ocean. This is important, as any that lands on soil remains in place, resulting in the potential for greater human exposure and increased chances of contamination to food supplies and property. In the Pacific, however, the strong Kuroshio Current (similar to the Atlantic Gulf Stream) helped move any contamination quickly away from shore and diluted it by mixing it into deeper water. This allowed us to report that by June 2011, even when we sampled within sight of the nuclear power plants, levels of cesium-137 and cesium-134 in the ocean, two primary products of nuclear fission, were elevated, but still below those considered of concern for exposure to humans. They were also well below biological thresholds of concern to the small fish and plankton we sampled, even if these were consumed by humans. Several other groups have now confirmed our findings about levels of radioactivity up to 400 miles offshore. Other measurements show trends that are more worrisome. Levels of radioactivity found in fish are not decreasing and there appear to be hot spots on the seafloor that are not well mapped. There is also little agreement on exactly how much radioactivity was released or even whether the fires and explosions at the power plant resulted in more radioactive fallout to the ocean than did direct releases of radioactivity caused by dumping water on the reactors to keep them cool. Japan is taking what some think of as a precautionary measure by lowering the limits of radioactive contaminants in drinking water and food supplies, including seafood, on April 1.The new level for fish will be one-tenth of the acceptable level in the United States. Will Japan's new limits build consumer confidence or raise fears and questions about why more fish are considered unsafe for consumption? And why were fish caught last year considered safe, but now are not? Despite the announcement in December that operators of the power plant had achieved cold shut down, we know they are still using tons of water to cool the reactors and that not all the water has been collected or treated. As a result, the ground around the site is like a dirty sponge, saturated with contaminated water that is leaking into the ocean. Marine sediments are also collecting radioactive contaminants, exposing bottom-dwelling fish, shellfish and other organisms on the sea floor to higher levels of contaminants than those in the waters above. Little is known, however, about the level of contamination in the groundwater and on the seafloor and whether these will be a source of contaminants long after levels in the ocean have become diluted to the point that only the most sensitive instruments can detect them. We do know that we can detect cesium at very dilute levels, well below those considered harmful. Using these sensitive techniques we can track the Fukushima contaminants as ocean currents carry the peak releases across the Pacific where they are expected to reach the U.S. West Coast in 2013-2014 at levels that are much lower than we measured off Japan in 2011 and thus not of concern to human health. Two weeks ago, we held the largest international gathering of marine scientists studying radioactive substances in the ocean originating from Fukushima. Although we shared freely what each of us has learned in the last year, what we need today is also what we needed on March 11, 2011 — greater international coordination of long-term studies of the fate and consequences of the radiation. We've done the initial assessments. Now we need to begin answering the tougher questions, building public confidence in scientific studies by having multiple, independent groups at work, and ensuring we have the resources to build comprehensive, long-term studies. As a scientist and a marine radiochemist, I am trained to provide answers about radioactivity in the ocean—how much is out there, where it is, and what its fate is likely to be in the future. Today, we haven't gone very far beyond the first question, which was key on March 11, 2011, but hardly seems sufficient one year later. The Japanese government and government researchers cannot deal with any of these effectively. The Kan administration turned down the offer for help from the US and other nations for the Fukushima I Nuke Plant accident, citing some "national security" concerns. Mr. Edano, current Minister of Economy, Trade and Industry and then-Chief Cabinet Secretary under PM Kan, still says he, as Chief Cabinet Secretary, did not turn down the offer but told the US and others "We will consider your offer". That is, as fans of Sir Humphrey Appleby know, a bureaucrat/politician speech for "get lost". Will this change? Not very likely. As Mr. Buesseler would know, there are different movements of seawater depending on the depth and proximity to the coast in addition to a major move by a major current like "Kuroshio". Significant amount of radioactive materials moved south along the coast, creating ever-shifting hot spots along the way, contrary to what the government researchers had assured the public (that they would be carried away by Kuroshio and disperse rapidly and evenly in the Pacific Ocean). Mr. Buesseler may also be interested to know that squid, crab, and abalone have been found to highly concentrate radioactive silver from the ocean environment with ND level of radioactive silver (see my post on abalone). The ND levels of radioactive materials can still become harmful, because of bioconcentration. Woods Hole Oceanographic Institute did the only marine survey by international researchers approved by the Japanese government in June 2011. The summary of the survey result, I just found out, was posted on their website on December 6, 2011. Their study finds the levels of radioactivity, while quite elevated, are not a direct exposure threat to humans or marine life, but cautions that the impact of accumulated radionuclides in marine sediments is poorly known. With news this week of additional radioactive leaks from Fukushima nuclear power plants, the impact on the ocean of releases of radioactivity from the plants remains unclear. But a new study by U.S. and Japanese researchers analyzes the levels of radioactivity discharged from the facility in the first four months after the accident and draws some basic conclusions about the history of contaminant releases to the ocean. The study, conducted by Woods Hole Oceanographic Institution chemist Ken Buesseler and two Japanese colleagues, Michio Aoyama of the Meteorological Research Institute and Masao Fukasawa of the Japan Agency for Marine-Earth Science and Technology, reports that discharges from the Fukushima Dai-Ichi nuclear power plants peaked one month after the March 11 earthquake and tsunami that precipitated the nuclear accident, and continue through at least July. Their study finds the levels of radioactivity, while quite elevated, are not a direct exposure threat to humans or marine life, but cautions that the impact of accumulated radionuclides in marine sediments is poorly known. The release of radioactivity from Fukushima—both as atmospheric fallout and direct discharges to the ocean—represent the largest accidental release of radiation to the ocean in history. Concentrations of cesium-137, an isotope with a 30-year half life, at the plants's discharge point to the ocean, peaked at over 50 million times normal/previous levels, and concentrations 18 miles off shore were much higher than those measured in the ocean after the Chernobyl accident 25 years ago. This is largely due to the fact that the Fukushima nuclear power plants are located along the coast, whereas Chernobyl was several hundred miles from the nearest salt water basins, the Baltic and Black Seas. However, due to ocean mixing processes, the levels are rapidly diluted off the Northwest coast of Japan. The study used publically available data on the concentrations of cesium-137, cesium-134, and iodine-131 as a basis to compare the levels of radionuclides released into the ocean with known levels in the sea surrounding Japan prior to the accident. Impacts of the Fukushima Nuclear Power Plants on Marine Radioactivity is published in the latest issue of Environmental Science & Technology and is available on the journal's website. Buesseler received funding support for this work from the Gordon and Betty Moore Foundation and the National Science Foundation’s Chemical Oceanography program. The investigators compiled and analyzed data on concentrations of cesium and iodine in ocean water near the plants’s discharge point made public by TEPCO, the electric utility that owns the plants, and the Japanese Ministry of Culture, Sports, Science and Technology (MEXT). The team found that releases to the ocean peaked in April, a fact they attribute to “the complicated pattern of discharge of seawater and fresh water used to cool the reactors and spent fuel rods, interactions with groundwater, and intentional and unintentional releases of mixed radioactive material from the reactor facility.” They also found that the releases decreased in May by a factor of 1000, “a consequence of ocean mixing and a primary radionuclide source that has dramatically abated,” they report. Buesseler says that at levels indicated by these data the releases are not likely to be a direct threat to humans or marine biota in the surrounding ocean waters, but says there could be concern if the source remains high and radiation accumulates in marine sediments. “We don’t know how this might impact benthic marine life, and with a half-life of 30 years, any cesium-137 accumulating in sediments or groundwater could be a concern for decades to come,” he said. In June, Buesseler led the first international, multidisciplinary assessment of the levels and dispersion of radioactive substances in the Pacific Ocean off the Fukushima Dai-Ichi nuclear power plants—a major research effort also funded by the Gordon and Betty Moore Foundation. During the research expedition, a group of 17 researchers and technicians spent two weeks aboard the University of Hawaii research vessel R/V Kaimikai-O-Kanaloa examining many of the physical, chemical, and biological characteristics of the ocean that determine the fate of radioactivity in the water and potential impact on marine biota. The results of their initial assessments will be presented in Salt Lake City in February 2012 at the Ocean Sciences Meeting, an international gathering of more than 4,000 researchers sponsored by The Oceanography Society, the American Society of Limnology and Oceanography, and the American Geophysical Union. While international collaborations for comprehensive field measurements to determine the full range of isotopes released are underway, it will take some time before results are available to fully evaluate the impacts of this accident on the ocean. "However, due to ocean mixing processes, the levels are rapidly diluted off the Northwest coast of Japan." - Uh... northwest? Fukushima I Nuclear Power Plant is in the northeast part of Japan. That aside, I am puzzled by their conclusion that the releases of radioactive materials into the seawater, which is on-going, are not likely to be a direct threat to marine life, when fish and abalones from the coastal water of northeast Japan have been found with high concentration of radioactive cesium and radioactive silver. Researchers have found plankton far off the coast of Fukushima with concentrated radioactive cesium. Is it possible that all the Woods Hole researchers took as samples was ocean water, and not marine life (plankton, seaweeds, fish, shellfish, etc.)? Or are they saying few hundred becquerels/kg of radioactive cesium won't affect the fish? The minister in charge of the Fukushima nuclear accident and the Minister of the Environment Goshi Hosono has just started tweeting. You can follow him if you want, at @hosonogoshi54. So far, only two tweets, following no one, and 1,097 people following. his handling of the Fuku-I accident, etc. When the nuclear accident started last March, he was an assistant to then-Prime Minister Kan. He was the one who said "We knew it was a meltdown but just didn't feel like telling anyone", as soon as a few days after March 11, 2011. Most recently in Kitakyushu City in Kyushu where he descended to drum up support for wide-area disposal of disaster debris, he didn't even know how many tonnes of disaster debris were there in Ishinomaki City, when asked by a reporter. He froze, and then looking for someone who could assist him. Before that, he was apparently making up a story of Kitakyushu City building a temporary incineration plant. The city officials later said, "That's news to us." Inzai City is located in the northwest corner of Chiba Prefecture, sitting in the immediate east of the high-radiation "Tokatsu" region that includes cities like Kashiwa, Nagareyama, and Abiko. Chiba Prefecture announced on March 27, 2012 that bamboo shoots (spring delicacy in Japan) harvested in Nagareyama City and Inzai City exceeded the soon-to-be implemented new safety standard for radioactive cesium (100 Bq/kg), and requested the majors of these cities to instruct farmers to voluntarily withdraw the bamboo shoots from the market. Again, if it's done "voluntarily", the local or national government does not need to compensate the farmers. Nagareyama City is the one who quietly shipped the ashes from the garbage incineration plant by rail to Akita Prefecture to be buried last July. Akita Prefecture found out that the ashes contained 28,100 becquerels/kg of radioactive cesium (link is in Japanese) and they angrily returned the ashes back to Nagareyama. The last city on this table is where the controlled final disposal site is located for industrial and now radioactive waste. On March 22, a large amount of chloride ion was found in the well water at the disposal site that monitors contamination. The prefectural government thinks it is leaked from the disposal site, not because of the snow melting agent as the disposal site operator claims. So the radiation level of the dirt that 1st graders play with and the air radiation level near the classroom are higher than the dirt removed as part of "decontamination" effort. I wonder if the school knows what it's doing. JNST: "A scenario of large amount of radioactive materials discharge to the air from the Unit 2 reactor in the Fukushima Daiichi NPP accident"
Journal of Nuclear Science and Technology has a paper by Fumiya Tanabe of Sociotechnical Systems Safety Research Institute published online on March 28, 2012. Tanabe is the one who said last August that there was a second "meltdown" in Reactor 3 on March 20-21, in which the melted fuel dropped through the Reactor Pressure Vessel onto the floor of the Containment Vessel, releasing a large amount of radioactive materials that caused the spikes in radiation levels in wide areas in Tohoku and Kanto. In November last year (11/19/2011), he also disclosed his analysis of the Reactor 2 Suppression Chamber, and concluded that it may have been damaged by the earthquake. This paper looks to be that analysis, now peer reviewed and published. The paper was received on December 9, 2011, accepted final version for publication on January 24, 2012. Based on an analysis of the measured data with review of calculated results on the core melt accident, a scenario is investigated for large amount of radioactive materials discharge to the air from the Unit 2 reactor. The containment pressure suppression chamber (S/C) should have failed until the noon on 12 March 2011 only by seismic load due to the huge earthquake on 11 March or by combination of seismic deterioration and dynamic load due to steam flowing-in through safety relief valve. Opening of the two safety relief valves (SRVs) at 14 March 21:18 should have resulted in discharge of large amount of radioactive materials through the S/C breach with the measured air dose rate peak value of 3.130E-3Sv/h at 21:37 near the main gate of the site. The containment drywell (D/W) should have failed at 15 March 06:25, at the cable penetration seal due to high temperature caused by the fuel materials heating up on the floor of the D/W, which had flowed out from the reactor pressure vessel. Then large amount of radioactive materials should have been discharged through the D/W breach with the measured air dose rate peak value of 1.193E-2Sv/h at 15 March 9:00. Is Tanabe saying that venting of Reactor 2 on the night of March 14, 2011, with the Suppression Chamber already broken due to the earthquake, caused a discharge of a large amount of radioactive materials through the Suppression Chamber? What a tragi-comical sequence. Amateur hours. If the Reactor 2 Suppression Chamber was already damaged by the earthquake, what about other Reactors? Students at the prestigious (at least hard to get in) Tokyo University have formed a group called "Project to Think About 3.11 Debris". The group held a public symposium on March 28 on the Tokyo University Komaba campus, co-sponsored by Jiji Tsushin and others with "special support" from the Ministry of the Environment. Their message: More information disclosure from the national government should help; there is a "silent majority" who would gladly accept disaster debris. "The Project to Think about 3.11 Debris", where Tokyo University students discuss the issue of disaster debris from the March 11, 2011 earthquake/tsunami, issued its proposals to the national government to further disclose information to dispel citizens' fears of radiation contamination. The Project is co-sponsored by Jiji Tsushin and others, with the special support from the Ministry of the Environment. The proposals will be submitted to the Ministry of the Environment shortly. The Project pointed out that it was the delay in disclosing information by the government after the Fukushima I Nuclear Power Plant accident that has hindered the understanding by the citizens of the safety of the debris. It requested that the government strengthen the effort to disclose information so that citizens could determine the danger of radiation calmly [in a scientific way] and break a vicious cycle. The group suggested the government disclose the decision process when they had decided on the safety standard for the debris (8,000 Bq/kg of radioactive cesium). The group also told the audience that a construction of a rugby field was being planned in Kamaishi City in Iwate Prefecture using the debris, and suggested the government create a database of the projects at local municipalities in the disaster-affected areas. It also criticized that the debris disposal and rebuilding of cities and towns were being considered separately. Further, as to the disaster debris acceptance, the group said only the opponents were getting the air time, but "the disaster victims are reserved, and they don't complain or demand". In reality, there was a "Silent Majority" who wouldn't mind accepting the debris, the group said, and emphasized the need for more dialogues. If this seems contrived to you (I don't see why it shouldn't), it's because it is, contrived. This "Project to Think about 3.11 Debris" seems to have been organized by a joint educational venture between Tokyo University and Hakuhodo called "brand design studio". Hakuhodo is Japan's one of the two largest ad and PR agencies who has been getting a lot of jobs from the government ever since March 11, 2011 to spin the government policies and appropriately guide the general public. This entity is the "others" in the Jiji article above, who co-sponsored the event on March 28. If the national government thinks Tokyo University, Hakuhodo (or Dentsu for that matter), and the Ministry of the Environment exude honesty and truthfulness after one year of misinformation, and the citizens are willing to fall for this, there will be not much I can say. ...The 9.0 earthquake, tsunami and nuclear meltdown that hit the country on March 11, 2011, claimed almost 20,000 lives, overturned an economy that had already been foundering through 20 years of recession, and demoralized a citizenry dealing with one suicide every 17 minutes, a loss of direction, and what is now seven prime ministers in fewer than six years. Yet it also highlighted the resilience, self-possession and community-mindedness that are so striking in Japan; suddenly, the country that had seemed to insist on its difference from the rest of the world could be seen in its more human, compassionate and brave dimensions. Japan has long been what the globally savvy magazine Monocle called, in a recent issue, “The World’s Most Charming Nation”; now it is also one of those most grateful for visitors. You can read the entire article at the link. Japan's Ministry of Foreign Affairs and Japan Tourism Agency can't be happier. The Ministry of Education and Science released the data on radioactive fallout by prefecture in January 2012, on March 23. West of Shizuoka, it's all ND. Miyagi is supposed to have started measuring the fallout in March this year. From MEXT announcement on March 23, 2012, "Reading of environmental radioactivity level by prefecture (Fallout)(January, 2012)"
Fukushima Medical Univ. Researcher: "If People Do Their Own Decontamination, They Can Feel Secure"
The researcher, Shinichi Niwa, is talking about people in Fukushima Prefecture where the soil is very contaminated (probably with the exception of Aizu Region, although even there hot spots or hot areas do exist). Professor Niwa's comment is at the end of the article. Some 24.4 percent of people who were hospitalized in Fukushima with psychiatric disorders in the wake of the outbreak of the crisis at the crippled Fukushima No. 1 Nuclear Power Plant had done so possibly because of fears of radiation exposure, according to the results of research conducted by psychiatrists at Fukushima Medical University. It has also been found that of all the outpatients at 27 hospitals in Fukushima Prefecture, 30 percent of them visited hospital apparently for reasons related to the nuclear crisis, according to the research conducted by psychiatrist Akira Wada and others at Fukushima Medical University. There is no data available in the world on the effects of nuclear accidents on psychiatric diseases that were taken immediately after a nuclear accident, and therefore Fukushima Medical University plans to conduct a follow-up study on the effects on patients of the major nuclear accident and prolonged lives as evacuees. Wada and others at Fukushima Medical University carried out a survey at 30 hospitals in Fukushima Prefecture for two months from March 12, 2011, and 27 of them responded to the survey. Of the 610 inpatients who were admitted or readmitted to hospital, with men accounting for 49 percent and women for 51 percent, excluding those who were transferred to other hospitals because of the nuclear disaster, 74 of them, or 12.1 percent, were diagnosed as being related to their fears of radiation exposure, while 75 others, or 12.3 percent, were diagnosed as being possibly related to their fears of radiation exposure. People from the Soma, Futaba and Iwaki areas, which are close to the troubled nuclear power station, account for 23 to 27 percent of such inpatients. Of all the 74 inpatients whose hospitalization was diagnosed as being related to their fears of radiation exposure, nine of them had never had consulted psychiatrists before. Most of the 74 people were admitted or readmitted to hospital within one month from the outbreak of the nuclear disaster, and nearly half of them were in their 40s and 50s. There were cases of people who were suffering from stress from living in evacuation centers in addition to their fears of radiation exposure. At the same time, Itaru Miura, assistant professor at Fukushima Medical University, and others conducted a survey on outpatients at 77 hospitals and clinics in Fukushima Prefecture once a week for three months from March 12, 2011, to which 57 medical facilities responded. Of the 410 outpatients at the medical facilities who were suffering from depression or anxiety disorders, 78 of them, or 19 percent, were diagnosed as being linked to the nuclear disaster, and 55 others, or 13.4 percent, were diagnosed as being possibly related to the nuclear disaster. Of all the 133 patients, 47 of them were suffering from depression and 38 others were suffering from acute stress disorder and posttraumatic stress disorder (PTSD), and 38 other outpatients were also suffering from adjustment disorders. Nearly half of them had stress from their lives as evacuees, 40 percent of them were worried about the effects of radiation on themselves, and 30 percent of them expressed fears that their children and families could be affected by radiation. There were reports on the mental effects of radiation from the troubled Chernobyl nuclear power plant, but the research was conducted about 10 years after the outbreak of the nuclear disaster. Shinichi Niwa, professor at Fukushima Medical University, said, "I have the impression that the nuclear accident had such a great impact (that many people were admitted to hospital). Take decontamination work for example, people can feel secure if they do it themselves, rather than if they ask others to do it. It is also important to ease anxieties over radiation exposure with participation of local residents in such a program." NRC to National Labs Last Year Who Wanted to Help With Fukushima Radiation Analysis: "Knock It Off"
MR. SHARON: This is Brian Sharon. Quick question, well, not question, but I’ve gotten a couple of emails here today, from some of the National Labs, and they’re all — there are a couple of them chomping a the bit, you know, saying, “Ghee, can we help? Ghee, can we go calculate this,” with the codes and all that stuff. I keep telling them, “No, you don’t know the scenario,” but you know, somebody might want to call DOE and tell them to tell their labs to cool it, because the last thing we want is the labs going off, talking to the press, talking about consequences and all sorts of other stuff, because you know, they’re chomping at the bit, to do something, and I’m not sure, Eliot, maybe you’ve got a point of contact up there at DOE? MALE PARTICIPANT: If I could chime in on that? On the Deputy’s call yesterday, I was on with the Chairman, and Pete Lyons was one of the principals at DOE. Lyons may be a good source to contact at DOE. MR. JOHNSON: This is Mike Johnson. My other thought was, it may be just to cut to the chase, just to pass the same, to call the lab directors and say, “Knock it off,” or whatever messages we want to get to them. There are a number of ways we can do this. So, I agree, Brian, we’ve got to do it soon. MR. McDERMOTT: Okay, we’ll take that action from headquarters. In this particular transcript, there is also a mention of GE engineers who were present at Fukushima I Nuclear Power Plant when the earthquake and tsunami hit on March 11, 2011. See my previous post here. I watched the longer versions, and still couldn't figure out what it was that I was seeing. It looks like yellowish substance is being scraped by the camera or the tube. For more on this 2nd probe, see my post here (for March 26 operation) and here (for March 27 operation). 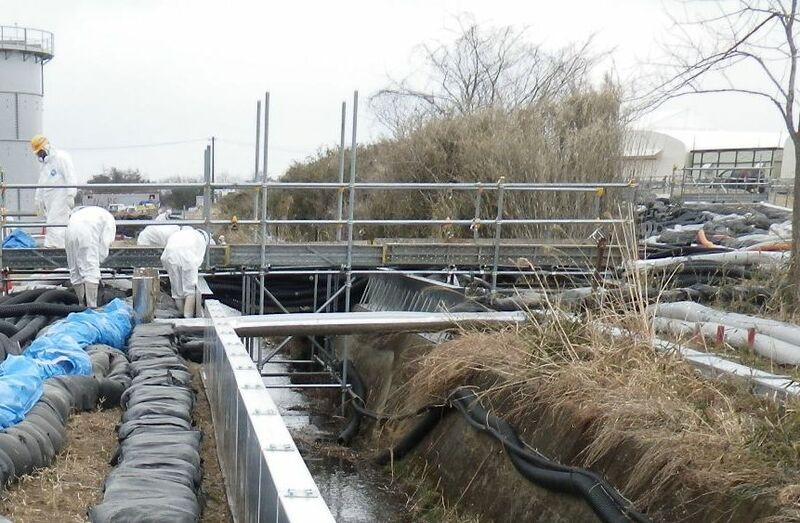 TEPCO transported 140 liters of the water after being treated by the cesium absorption towers (SARRY, Kurion) from Fukushima I Nuclear Power Plant to Fukushima II (Daini) Nuclear Power Plant for nuclide analysis, but somehow the water spilled and contaminated the buildings in Fukushima II. Duh. Why TEPCO needed to transport a large quantity of contaminated water just for analysis, no one knows. The water contained maximum 700 becquerels/cubic centimeter of radioactive materials, so the 140 liters of this water could contain 700 x 1000 x 140 = 98 million becquerels of radioactive materials. TEPCO announced on March 27 that the contaminated water spilled from the container and contaminated desks and corridors at Fukushima II Nuclear Power Plant. The water contained radioactive strontium and other nuclides, and was brought from Fukushima I Nuclear Power Plant to Fukushima II Nuclear Power Plant for analysis. The Nuclear and Industrial Safety Agency under the Ministry of Economy, Trade and Industry has instructed TEPCO to report the details, as the company is likely to have been in violation of the regulation that specifies how the contaminated water should be handled. According to TEPCO and the NISA, contamination was found at 7 locations in the service building for Reactors 3 and 4 at Fukushima II Nuke Plant, on the desks and corridors. Maximum 700 becquerels per cubic centimeter of radioactive materials have been found from the locations of the spill. There is no worker exposed to the contamination. "140 liters" information comes from the ad hoc NISA press conference on March 27 at 9:15PM (that's unusual these days). TEPCO announced the contamination as 206 Bq/cubic centimeter, but NISA says max 700 Bq/cubic centimeter. Total amount of the water was 140 liters. It's not known why such a large quantity of contaminated water was being transported. According to NISA, the amount of leak this time was small, but depending on the situation the entire amount could have leaked. If that was the case, INES (International Nuclear Event Scale) should be applied to the incident because of the amount of radioactive materials that would have been released; consequently, NISA considers the incident as INES Level 1, on a provisional basis. Another question. TEPCO touched on this spill very lightly at the 6PM press conference, and said there was only one contamination. But NISA says there were 7 locations that were contaminated. The spill happened at 12:42PM, and TEPCO didn't have the details at the press conference, 5 hours after. Too slow. Kino also reports this was the second time TEPCO transported a large quantity of contaminated water from Fukushima I to Fukushima II. Kino also says that the contaminated water is routinely sampled by the affiliate companies (probably Toshiba, Hitachi, and other top-tier contractors) for testing at their facilities.